I figured out a few things recently. Since Otus became my motorcycle the turn signal indicator in the instrument cluster hasn’t worked. Because he arrived in my garage that way I assumed there was a problem with the cluster itself. I changed the bulb but that didn’t matter. I cleaned the contacts but that didn’t matter either. I assumed that it was damaged and left it at that. It wasn’t until I started looking for a replacement instrument cluster that I figured out that the problem wasn’t the instrument cluster but rather the turn signal relay. Somewhere along the line someone swapped out the BMW relay for an automotive turn signal relay. It was moving to this relay that prevented the instrument cluster light from lighting up to let me know a turn signal was on. Figuring out stuff like this typically leads me into Quixotic situations. Once I got a lead on the reason the turn signal light in the instrument cluster wasn’t working I dug into the parts cache and retrieved one of the BMW turn signal relays. Installing the correct relay led to a wiring voyage of discovery, but getting that sorted out ended up making things work as they should so ultimately the change, and the ensuing work, was a good thing. With this problem behind me I was ready to upgrade the stock Airhead incandescent lighting in the instrument cluster to a solid state LED light kit from Katdash. 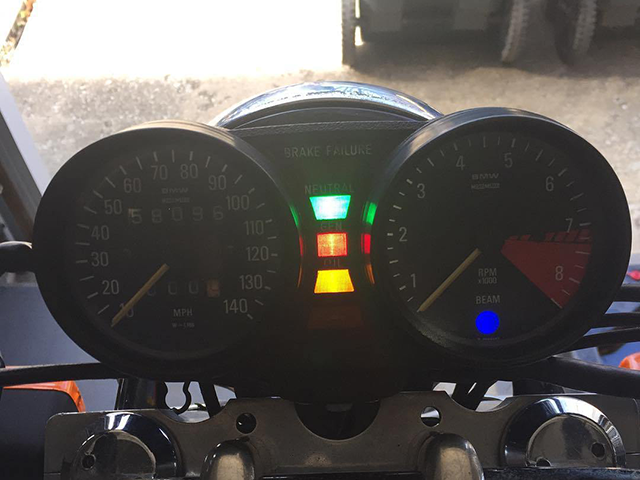 The lights in the stock instrument cluster are OK, but because “I was in there” it seemed like the right time to make another LED upgrade to go along with the LED headlight. Enjoy the pictures! The Katdash Makes The Gauges So Bright!